Thanks for those words. Funny enough I've had a spinal tap but that was 15 yrs ago when my neuro started to take me seriously because I had something called clonus (ankles shaking back and forth) and hyper reflexes And MS was suspected. But again, my symptoms had started years before the spinal tap and didn't get worse after it. Also, one neuro I saw in the ER had suggested arachnoiditis as a possible explanation for my symptoms and said CT was better at picking this up than MRI. I've never had a CT of my back. But given my history of autoimmune issues likes thyroid disease and migraines it who knows if when I injured my back that unleashed a bunch of autoimmune stuff that damaged my nerves rather than a classic cauda lesion. But at least progressive neuro stuff like MS and ALS has been ruled out given that my symptoms have not progressed to weakness. I have a bad habbit now with my frustration of punching through walls and breaking stuff which isn't good but proves I'm not "classically" weak. I have clonus in my stump. The whole thing “kicks”. Looks really pitiful. I’m hypothyroid, so I take Kelp. Are you hypo-, hyper-, Hashimoto, or something else? A CT of your spine could be helpful. You want to know for sure what you’ve “got”. Just be sure that, after it’s done, you keep control over what the doctors “do about it”. Once they finally “see something” , they can tend to run amuck, as in a feeding frenzy. Yes I have hashimotos. Crazy enough I was diagnosed with it exactly at the same time I injured my back in 2003 when I was 21. I gained 30 lbs and was tired all the time and just was acused of being lazy. Strangely after I went to the neuro after the initial discussion herniation no clonus. A year later when I had bladder issues the clonus and hyper reflexes appeared. My neuro said that is caused by an upper motor neuron lesion not a cauda lesion. However, like I said they did a spinal tap and multiple MRIs, then sent my to a psychiatrist. But what infuriates me is that something caused those abnormmalities. They weren't there before. Even now, every now and then when I'm tired or have walked a lot. I can check my ankle clonus and my foot will wobble back and forth indefinitely til I stop it. I have read anecdotally that physical trauma can trigger latent autoimmunity. Problem is no one in my family has any history of autoimmune disease. But I'm pretty sure there is a connection. I also have t2 diabetes and hypertension despite being 155 lbs and 5'10 and I was a runner. In all likelihood my issue is multifactorial. As for the CT, since I left my job the crappy government plan won't even pay for a Lumbar MRI of my back to follow up on my arthritis or disc herination. My primary ordered and they deemed it medically unnecessary. Until I collapse and can't walk and get to the ER in ambulabce I doubt I will be able to get more testing. phugoi1982, I’m pasting here a ‘reprint portion’ of something I put here on this forum on a different Thread. It’s something that I found on an alternative therapy forum. The info sounds reasonable to me. I would be amiss to believe that I have an answer to your autoimmune problem and yet keep quiet about it. I won’t belabour the point, but I hope you’ll go to these two links and check it out. I take herbs to kill parasites. Wormwood, cloves, and green black walnut hull tincture. I used to grow wormwood. And I used to make green black walnut hull tincture myself, gathering the walnuts (still inside their green hull) from off the ground where they’d fallen at a public park. Well, actually, they were Texas Walnuts, not Black Walnuts, but they worked really well. phugoi1982, I’m pasting here a ‘reprint portion’ of something I put here on this forum on a different Thread. It’s something that I found on an alternative therapy forum. The info sounds reasonable to me. I would be amiss to believe that I have an answer to your autoimmune problem and yet keep quiet about it. I won’t belabour the point, but I hope you’ll go to these two links and check it out. I take herbs to kill parasites. Wormwood, cloves, and green black walnut hull tincture. I used to grow wormwood. And I used to make green black walnut hull tincture myself, gathering the walnuts from off the ground where they’d fallen at a public park. Well, actually, they were Texas Walnuts, not Black Walnuts, but they worked really well. Thank you for those links! I will check them out in detail. It would not surprise me one bit if autoimmune diseases were due to intestinal parasites given that 75 percent of the immune system is in the digestive tract. I have slowly given up gluten and have pretty much been a very low carb ketogenic diet. No bread rice or pasta and vegetables in moderatiin It. Lots of avocados, nuts and more fish for Omega 3 as well drastically cut my red meat intake. It has helped keep cut my metformin for diabetes in half. Have not noticed any other ill effects or other benefits but want to give it some time. Ooooh! (Squeals with delight) This is my favorite article yet on “parasites and Hashimoto’s”. “How Can An Infection With A Parasite Cause Hypothyroidism? First of all, it’s important to understand that most parasitic infections won’t result in hypothyroidism. But certain parasites can trigger an autoimmune response, and thus if someone has a genetic predisposition for Hashimoto’s Thyroiditis, then having a parasitic infection can lead to the development of this condition. And many cases of Hashimoto’s Thyroiditis will result in subclinical hypothyroidism, which over time can progress to overt hypothyroidism. So a parasite usually doesn’t directly affect the thyroid gland, but instead affects the immune system, which in turn causes it to damage the thyroid gland, thus leading to hypothyroidism. How Do You Treat A Parasitic Infection? Here’s yet another alternative therapy article saying that parasites cause autoimmune disease. —A research article that mentions Hashimoto’s. And...if you do a liver flush, you’ll be able to eat spaghetti like a happy Italian. Honest. You can forget all that tasteless, textureless, gluten-free bread. Google “liver flush”. phugoi1982, regarding your back pain,...I’ve thought of another possibility. Calcium oxalate crystals could be causing it. These crystals form due to a time of dehydration, renal insuficiency, etc. The herb Stone Breaker (Chanca Piedra) can soften the crystals. The crystals hurt like little shards of glass. I’d been having back pain for several days. I took my kidney herbs that I use for UTI’s, but my urine flow was good. I used my SyncroZap, that always helps UTI’s, pain dimished temporarily and my complexion cleared up. I took my parasite-killing herbs, and my thinking cleared up. But the back pain continued. Finally, this morning while I was waking up, I realized that I don’t have any fever —just PAIN, like shards of glass. Aha! The words “oxalate crystals” popped into my head. Happily, I keep Chanca Piedra in my kitchen drawer. I’ve had two big cups of Chanca Piedra tea today, and I’m on the road to recovery. How did I get into this pitiful condition? Well, my diet for the previous two weeks was exactly the same as the list of foods that CAUSE it,...listed in the article at the following link. Need to vent!!! So, the recommendations of the "Undiagnosed diseases program" that rejected me was to get a second opinion from a Rehab hospital that specializes in Spinal Cord Injury like Spaulding in Boston which is one of the best. First of all, are these people idiots? Rehab hospitals will treat BASED on an F*ing diagnosis which I do not have. In fact, I called this hospital two years ago and they refused to take me and I called another one now in DC and they also will not take me because I have no physical limitations. When are these morons going to realize that I need A DIAGNOSIS and that I obviously have an ATYPICAL case of Cauda Equina. Fortunately, the medical team that rejected me is going to call my Urologist who referred me and give him more info and hopefully he will continue to reiterate his belief that I have a Cauda lesion. At this point (and I'm joking), I sometimes wish i could go to a hospital ER with a gun and demand attention and a diagnosis (for those of you like the show House M.D. there was an episode where a patient who was sick and dismissed did this). Instead, in America, we have a sytsem that is more sympathetic to alcoholics and drug addicts and people who are depressed with really no reason for it and people like us who are physically ill don't get any attention. It makes me so mad that despite having this problem and being diabetic, hypertensive, thyroid disease, high cholesterol, and being only 36 and 5'10 and 160 lbs I still eat healthy and have never turned to alcohol or drugs even though with the level of anger and depression I feel It would be so easy to do so. Totally feel your pain. When I’ve been caught in a similar loop, after becoming exhausted to the point of crying, then I’ve stumbled upon a person or program who will say, “Oh, for that you need “abc””, and they open the door to an entire arena of services that none of the ...well, idiots (what else could they be? )...ever mentioned to me before. I think at least for me what drives me crazy is that every year that goes by gives my condition a sense of permanency and dreaded normalcy. But since I don't have a diagnosis I don't have a sense of closure. It's not like having Lupus or MS where ALS where you can mourn what you've lost and question "why my?" but at least you have a reasonable set of expectations because you know what the hell is going on. Also, all my family keeps pushing on me is go see a therapist..bla bla. I have, and 5 years of psychological counseling hasn't helped me at all even though I had a wonderful psychologist. Not to mention I was screwed by the doctors when I had initial symptoms and sent to psychiatrists who unloaded all the BS babble on me. Also, because I'm fully ambulatory and walking it gives me a false sense of hope that maybe the nerve damage can be fixed but it's usually the smaller nerves that are harder to heal from what I understand. The invisible injuries allow others to speculate wildly. I don’t remember if I’ve asked you to try kratom. Maeng Da strain. It will give you a few hours of relief with, as far as I can tell, no unwanted side effects at all. I will give that a try. So far the only thing ive really stuck to us a low carb high diet which I read has potential neuroprotective effects as well as neurogenerative ones. Along that same line of reasoning, I used to take Standard Process products. They were almost miraculous. But the prices are now astronomical, and I haven’t bought any since my SCI injury. 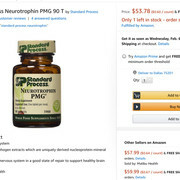 The one called Neurotrophin is even more expensive than most of their others, but that’s the one I would buy if I could afford it.